A new robotic commercial cargo ship for the International Space Station skipped its first attempt to link up with the orbiting lab Sunday (Sept. 22) due to a rendezvous glitch that delayed the spacecraft's arrival for at least 48 hours, NASA officials say. The unmanned Cygnus spacecraft built by Orbital Sciences Corp. was expected to be captured by a robotic arm operated by astronauts inside the space station later today at 7:25 a.m. EDT (1125 GMT) before the glitch appeared. Cygnus launched to the space station on Wednesday (Sept. 18) and is making its debut flight test to the orbiting lab. The Orbital Sciences Corporation Antares rocket, with the Cygnus cargo spacecraft aboard, is seen as it launches from Pad-0A of the Mid-Atlantic Regional Spaceport (MARS), Wednesday, Sept. 18, 2013, NASA Wallops Flight Facility, Virginia. Cygnus is on its way to rendezvous with the space station. Because of the approach trajectory of the Cygnus spacecraft, it will take two days for the orbital mechanics to align to allow a second attempt to link up with the space station, NASA officials explained. That means skywatchers have two more chances to see Cygnus in space from the ground, if you know when and where to look. The Dulles, Va.-based Orbital Sciences built the Cygnus spacecraft and its Antares rockets to fly unmanned cargo delivery missions to the International Space Station for NASA. This first Cygnus flight marks the last milestone for Orbital under NASA's Commercial Orbital Transportation Services program, which awarded the company $288 million to develop the spacecraft. Orbital Sciences now has a $1.9 billion contract to fly eight cargo missions to the station using Cygnus and its Antares boosters. The first of those missions could launch in December if this first test flight goes well. 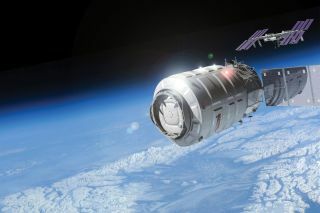 During the first Cygnus shakedown cruise, Orbital engineers are putting the spacecraft through a series of 10 in-flight tests to make sure it is safe to approach the International Space Station. Eight of those tests are scheduled for rendezvous day, Orbital officials have said. The Cygnus spacecraft is a bus-size spacecraft shaped like a large cylinder. It is about 17 feet (5 meters) long and 10 feet (3 m) wide, and designed to haul up to 4,409 pounds (2,000 kilograms) of cargo in its current configuration. For this first test flight, the Cygnus cargo ship is packed with about 1,543 pounds (700 kg) of supplies and gear. Orbital Sciences is one of two commercial spaceflight companies with billion-dollar deals to provide cargo deliveries to the International Space Station. The other company is the Hawthorne, Calif.-based SpaceX founded by billionaire entrepreneur Elon Musk. SpaceX has a $1.6 billion contract for 12 cargo delivery flights to the space station using the company's Dragon space capsules and their Falcon 9 rockets. SpaceX has successfully flown two cargo deliveries and a test flight to the station so far. With the retirement of NASA's space shuttle fleet in 2011, the space agency is depending on SpaceX and Orbital Sciences to keep the space station stocked with the supplies astronauts need. Unmanned cargo ships by Russia, Japan and the European Space Agency can also make deliveries to the station.